It takes a lot of cells to make a human brain. The organ houses not only an enormous quantity of neurons (tens of billions), but also an impressive diversity of neuron types. In recent years, scientists have been developing inventories of these cell classes—information that will be essential for understanding how the brain works. Contributing to this effort, a new study from Rockefeller scientists describes a novel methodology for characterizing neurons and their gene expression patterns with unmatched precision. 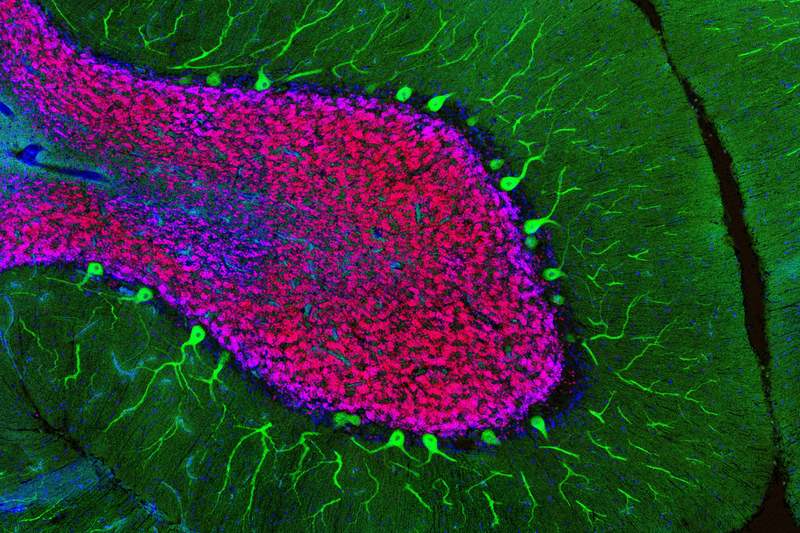 A mouse brain is not the same as a human brain—this much is not controversial. Yet, when it comes to the cells within these nervous systems, teasing out discrepancies is not so simple. For example, granule cells are found in the cerebellar region of both mouse and human brains. And under the microscope, a granule cell looks about the same, regardless of which animal it came from. Nathaniel Heintz, the James and Marilyn Simons Professor and a member of the Kavli Neural Systems Institute, suspected that neurons from different species vary in subtle but important ways. To identify any such differences, his lab set out to determine which genes are expressed in cerebellar neurons from mouse and human brains. Improving on established techniques, research associate Xioa Xu used cell-specific antibodies to purify nuclei from well-documented neural subtypes—Purkinje cells, granule cells, and basket cells—and to analyze which genes they expressed. To confirm these results, graduate fellow Elitsa Stoyanova used a technique called ATAC-seq, another way of determining which genes are turned on in a particular cell. Aging, the researchers discovered, is not the only factor that can affect gene expression. In some brains, they observed distinct genetic deviations that were caused by some unknown variable—possibly a brain disorder, or possibly some other factor. More research will be required to establish what might underlie this type of change in gene expression. However, Heintz says he is encouraged by the fact that his team was able to observe these changes at all.